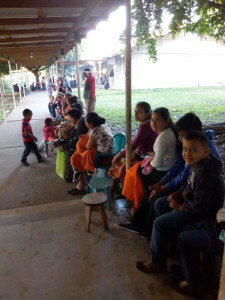 I was privileged this past November to travel to Guatemala with an Organization called Refuge International. 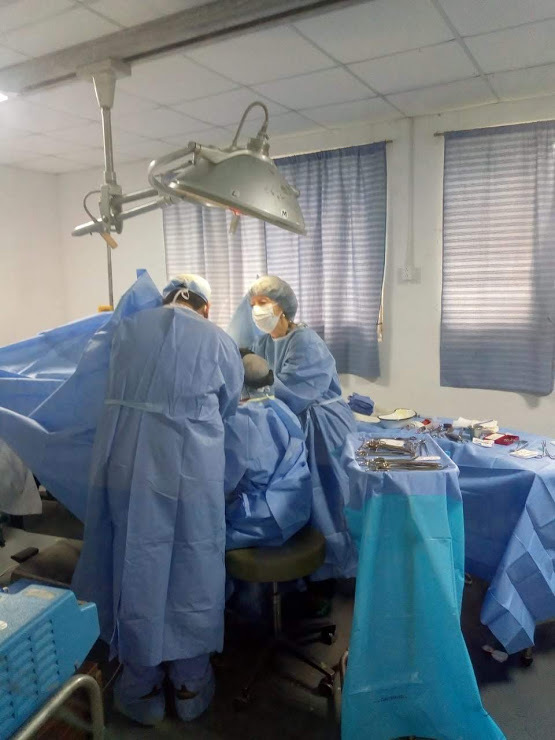 I was part of a minor surgery team that returns to the mountainous town of Chocola three times a year at the invitation of local doctor Sergio Castillo. 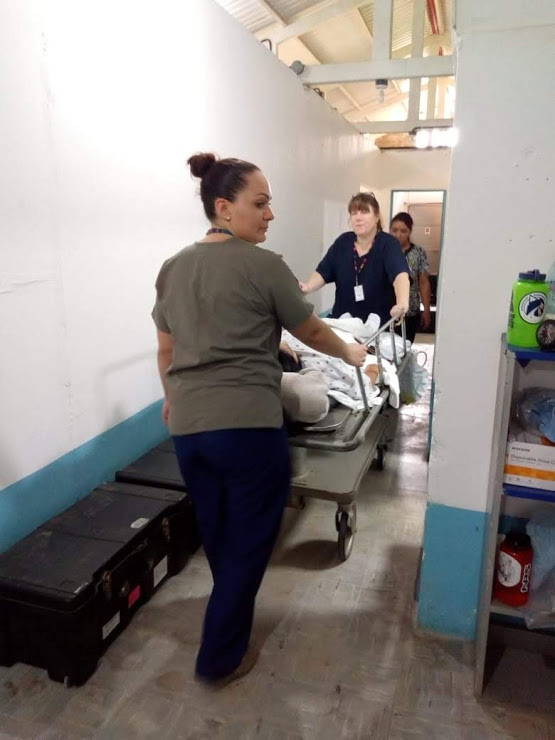 Knowing that the surgery team is coming, Dr Castillo gathers up patients who appear in need of surgical intervention and arranges for them to return at the designated time. The surgery team consisted of two surgeons, one ob/gyn and one general surgeon, two anesthesiologists, and 6 RNs. The first day of operation there was already a line out the door and down the walkway. Our two surgeons examined each patient and determined what, if any intervention was needed. My role was primarily as a “pre-op” nurse. When I was first told this I said “But, thats not what I do back home!” And I was told very kindly, “You know that thing back in the states where you have to be certified and ordained and have so many titles after you name to do something? Well here, thats not how it works. Here, you do what we need, and thats what we need. Don’t worry, well show you what you need to know, and we are all here to support each other.” I wanted to protest further, but in comparison, I got off easy. The nurse practitioner from Colorado was told that he was going to be a circulator in the OR. So I buckled down and got to work. Each patient who was scheduled for surgery first came to me. With the help of an interpreter we did a pre-op checklist with each patient. Often our patients were Kiche speaking (the language of an indigenous population of the central highlands) and our Spanish/English interpreters could not communicate with them. So a Spanish speaking Kiche nurse from the clinic would have to interpret the patients answers from Kiche to Spanish, so that the Spanish interpreters could then tell me the answers in English. Once that was done, I took vitals, started IVs, and if the patient was an oby/gyn one, they all got TED hose. As patients started coming out of the ORs, I began double duty and helped the post-op nurse recover patients. As patients were recovered we moved them to the “ward” area. Usually by 9 or 10 pm we handed off the patients to the clinic nurse, who stayed with them over night. The post op nurse and I traded each other out for breaks, but otherwise were on duty for the entire day. I slept by 11 pm, and was up again at 6:30 for breakfast and our morning meeting. By 8:00 we had our clinic open and we were off for the day. Over the course of the five days that we were in operation we completed over 30 surgeries. There were hysterectomies, vaginal cysts, various myelomas, gall bladder issues and kidney stones. There were also a large number of abdominal hernias. This was a particular problem for the indigenous populations who did agriculture work high in the mountains (primarily growing coffee beans), and would carry huge sack of produce down the mountains causing these injuries. They were so grateful for the hernia repairs, so that they could get back to work. While Rojelio stood out for his warmth and cheer, I was very aware that many of the patients I pre-opted were nervous and some clearly scared. I was also aware that once the interpreters were out of the room I had almost zero ability to communicate with some of the patients. My Spanish was weak and my Kiche nonexistent. So I did the best I could with gestures and reassuring smiles. And when something important came up, it seemed that an interpreter would magically appear. We had no complications from our surgeries besides pain. Almost everyone was able to go home the next day. We did have some equipment failures. One of the anesthesia machine failed on second day of clinic. Two technicians from the city arrived by late morning and we were up and running again by afternoon. The autoclave we had was apparently a portable army surplus, and proved temperamental at times. Of minor importance, I could never quite figure out my mosquito netting on my bed and would wake up in the morning with it anywhere but over me. Fortunately the mosquitos were not a problem in Chocola at that time. What most impressed me was the incredible warmth and generosity of the two physicians that were on our trip. Dr Page and Dr Eveland were absolutely self-less and 100% committed to giving each of their patients the absolute best care they could. And they had been coming to this site for years, and intended to keep coming. Watching them in surgery, the painstaking work they were doing, and the amount of time to stitch and stitch and stitch, was so impressive. I was also impressed by the other volunteers, who gave of their time and energy with patients and cheerfulness. I felt honored to be part of this worthy group of people. This trip was made possible for me largely due to the scholarship I received from One Nurse at a Time. Being a single mom with multiple kids in various stages of schooling, I have limited resources. I had thought that I would have to wait to do a mission trip until my kids were grown and no longer needing my financial support. 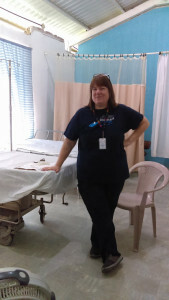 Then I was introduce to One Nurse by my co-worker and fellow mission trip buddy. Encouraged by my friend, I applied and happily I was chosen by One Nurse as a scholarship recipient. I so appreciate the support I have received from this organization. This trip has had a huge impact on my life. I had travel and lived in various foreign countries before, but this was my first trip to a Spanish speaking country. I loved Guatemala. I love the warm people, the delicious food, and the gorgeous weather and landscape. I would definitely go back. The mission work itself was actually harder than I was anticipating. I am not sure why, but I was surprised to find that I was actually needed. I was integral to the running of our clinic, and that team would have been short without me. They were long days, hard work, and falling into bed each night exhausted. It is also hard to contemplate how in the hospital I work at in the US, we are so flush with supplies and in Guatemala we were struggling. 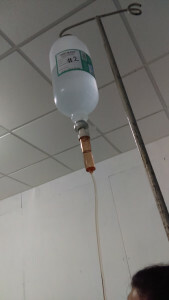 If I missed an IV I regretted that I had now one less IV and it had gone to no use. Participating in a mission trip has been very moving. Serving is always a humbling experience. Serving and experiencing a new culture at the same time is profound. It opens your eyes in a way that makes you see the world and yourself in a different way. Giving of yourself without expectation of return adds such positive energy to the universe. Its value should not be underestimated. I highly encourage anyone considering a mission trip, to do so. For yourself, for the world.